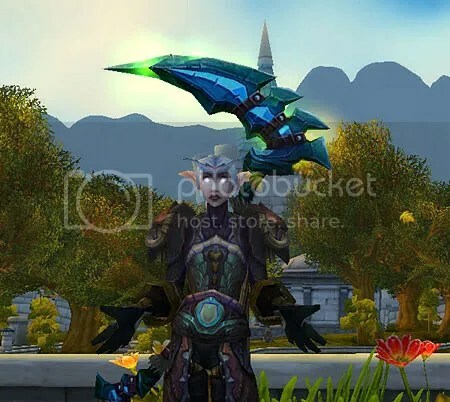 I was writing a post about the trials and tribulations of trying to collect my desired transmog gear when something happened that made me see guild drama and guild friendships in a whole new light. I’m in a guild, we all get along because we’re all me. Oh sure, we have our bad days. The times when an alt gets a drop/mount/pet that the main wants it gets a little tense but usually we’re all BFFs. I called my daughter and asked her to see if my son-in-law could log into Fenris and invite my new paladin to the guild. He has a level 9 in the guild and logs in every year or so to invite my new characters. I always try to bribe him to stay with offers of gold but it hasn’t worked so far. When he plays WoW he’s as loyal to his server as I am to mine. If I ever manage to get the parental lock off my account maybe we could play together through real ID. Yup, parental lock, I’ve locked myself out of real ID, but that’s another story. We chatted a bit, I told him I was an official gold buyer now. I felt like I had to buy a Guardian Cub and sell it. It seemed like one of those things you just have to participate in like the Zombie Event. I got in the zombie spirit then and mildly annoyed people just enough to feel I had done my part. One of those, “I remember when …” moments. Yes, sonny, I remember when I was in the great cub gold rush back in ’11, them was good times. I got sidetracked and wasn’t paying attention after a while and then noticed in the chat panel “bye” and then immediately after, “son-in-law” has logged off. For a second I forgot who it was and though, Oh, are they mad? Did I do something? I then remembered who it was. I started thinking about the conversation we’d had. Since I know the real life person I had context, I tried to imagine the numerous ways things that we’d typed could be misinterpreted if you didn’t have context and didn’t really know the person, their sense of humor or lack thereof. When I was in guilds with actual people, for the most part they were fraught with drama. The first guild I joined was great, but after they disbanded I joined a succession of drama-laden guilds until I just gave up. What’s wrong with people, can’t we all just get along. Whoops. I’m now thinking it’s somewhat amazing as many friendships are born in an environment of just text, no context. I’d think having Vent would make it easier as emotion and humor convey through voice, but just text, man that’s hard. So I apologize to all those who I thought were being drama queens for always being in a snit at someone. Interpreting text is harder than I thought and humor has to be conveyed through funny little character combinations. If you say something without remembering the lol, you may have just started drama or hurt someone’s feelings. I think it’s astounding that so many friendships have been made in WoW through the medium of text. Not an easy thing to do. Oh, and another one bites the dust. I hear that song every time I zone into Uldum, I have my fifth Stood in the Fire now. Deathwing is really, really, mad. Anyone know the movie reference of the title? Hey, it won’t give away your age, you can just say you’re an old movie buff … ahem … you know, like me.